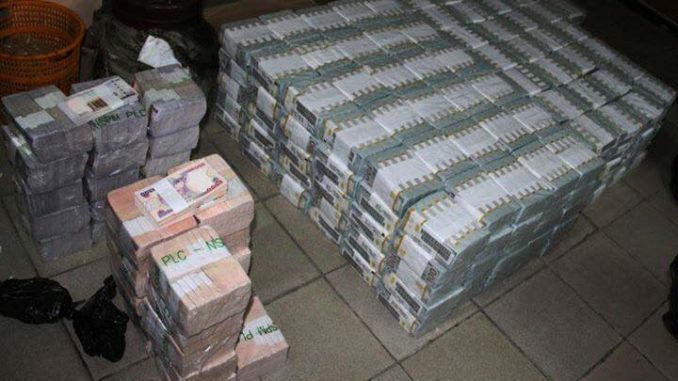 The administrative panel constituted by the Federal government to investigate the financial state of the Nigeria Social Insurance Trust Fund has uncovered about N62.555 billion fraud in the agency, saying the money was spent without proper accounting procedures being followed. The panel finding is contained in a report submitted to government on Wednesday just as the Minister of Labour and Employment, Senator Chris Ngige said any member of staff indicted by the report will be made to face the law in accordance with extant laws and the provisions of the civil service rules. Chairman of the Administrative Panel, Ishaya Awotu said while presenting the final report of the panel to the Minister of Labour and Employment, Senator Chris Ngige that the financial book of the fund has not been fully audited since 2011. The panel discovered that several unauthorized allowances were paid to the staff and management of the fund while over sea trips and training were carried out without the necessary approval from the office of the Secretary to the Government of the Federation as required by the civil service rules. The Minister of Labour and Employment had, in February 2018 inaugurated the panel to investigate the finances of the fund following a damning report from the Economic and Financial Crimes Commission indicting former Board members of the fund. Some senior management staff of the fund was also sent on compulsory leave to allow the panel carry out its assignment without any interference. Awotu said that the panel noticed weaknesses In the operation of the Fund, adding that even though the Fund had External Auditors for the period 2011 to 2015, the audited financial statements and the management letters for year 2011, 2012, 2013 and 2014 were submitted to the Management, but were not concluded reports. “Contrary to the provisions of Financial Regulation 402 the Fund does not maintain Expenditure Vote Control Books required for the monitoring and control of the various sub-heads. None maintenance of the vote-books made it impossible for the Fund to control extra budgetary spending. “The sum of N2,650,731,225.93 (Two Billion, Six Hundred and Fifty Million, Seven Hundred and Thirty One Thousand, Two Hundred and Twenty Five Naira, Ninety Three Kobo) deducted from various payments in respect of Withholding Tax, Pay-As-You-Earn (PAVE), Value Added Tax, Pension and National Housing Fund were no remitted to the relevant Authorities. “Irregular allowances totaling N5, 744,968,834.13 were paid to Staff and Management of the Fund. These allowances were paid without the approval of National Salary, incomes and Wages Commission for allowances being paid to its staff and management. The panel recommend that the Management of the Fund should without further delay conclude the External Auditors’ Reports for the period 2011 to 2015, while another set of External Auditors should be appointed with immediate effect to audit the accounts of 2016 and 2017 financial years as audited accounts for 2017 financial year ought to have been submitted on 30th May, 2018 in accordance with the Financial Regulations. The panel also said that NSITF should carry out full reconciliation of assets acquired and recorded in the cashbooks against the Fixed Assets Register, saying “Schedules to the Fixed Assets should be updated to correspond with fixed assets balances in the general ledger. Henceforth, the Fund should endeavor to update their Fixed Assets Register and schedules as the assets are acquired . “A Professional Firm of Accountants should be engaged to carry out in-depth examination of transfers in-between the accounts to ensure that the transfers of N15, 37,757,697.91 (Fifteen Billion, Seven Hundred and Thirty Seven Million, Seven Hundred and Fifty Seven Thousand, Six Hundred and Ninety Seven Nalra, Ninety One Kobe) were properly accounted for. “The Fund should also produce the relevant supporting documents. For the various payment vouchers with total monetary value of N8,376,083,789.72 (Eight Billion, Three Hundred and Seventy Six Million, Eighty Three Thousand. Seven Hundred and Eighty Nine Naira, Seventy Two Kobe) to substantiate the payments. “The Staff should be trained on the utilization of the acquired it. Equipment to add value to service delivery. Henceforth, all approvals for Overseas Tours and Trainings should be obtained from the Secretary to the Government of the Federation in line with extant circulars before they are undertaken. Receiving the report, Minister of Labour and Employment, Senator Chris Ngige assured that the report of the panel will be implemented fully and the lapses identified corrected. He said further that “Following the whistle blowing policy of this administration, the EFCC moved into the place and did some forensic auditing of the accounts of the agency. “No good investment, no bank reserve and failing to carry out their responsibilities to their workers to the extent that the PAYE deducted, the pensions, and the National Housing Funds deducted were not remitted to the appropriate authority and the money is no where to be seen in the account. These are very strong financial misapplication and misappropriation. “You have helped us to create a new NSITF that will be financial ok. It was I lieu of this that the Ministry did not want to be stampeded to put in place a new Board especially because the EFCC report indicted some members of the former board. “Those indicted included those nominated by the Nigeria Labour Congress and the Nigeria Employers Consultative Association. So. We were not in a hurry because we needed to give the new board a new lease of life because you don’t put new wine in old wine skin.